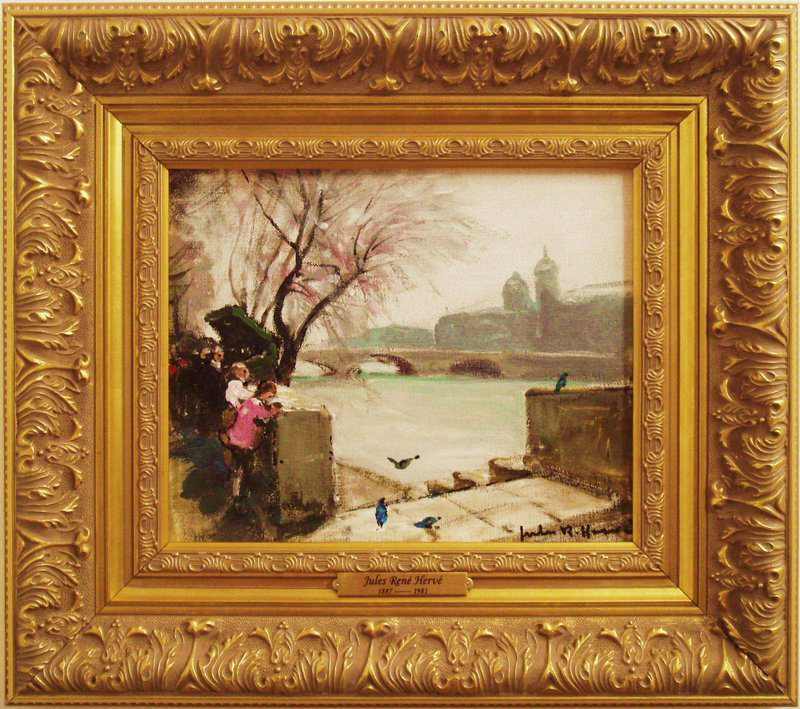 “Enfants Sur La Seine” Oil on canvas, 10 3/4" x 8 3/4"
J.R. Herve was born in 1887 in Langres, a town in the eastern part of France. He began his art studies in an evening school of his hometown. He went to Paris where he first continued his studies at the School of Decorative Arts and then at the Fine Arts School. He exhibited his works for the first time at the Salon of French Artists in 1910. He was one of the most important members of this group. Obtaining his teaching diploma, he started teaching. From 1911 to 1943 he taught painting to many generations of young artists. Numerous awards,honours and distinctions followed throughout his life through regular exhibitions at the various Paris Salons. In 1914 he received the Medaille d'Argent at the Salon des Artistes Francais,where he exhibited regularly. Afterwards he unfortunately had to join the army for the duration of the war. Herve is both a painter of daily country themes in which there are characters at their daily tasks, and a painter of Parisian scenes. He interprets his scenes with sensibility, putting all his heart into his work. All his artistic sensitivity is achieved by incredible strokes of light and color. Not only is Herve a painter of great talent, he represents the purest tradition of French art. He paints just like the great impressionists of former times, playing with his colors as a musician does with his musical instruments. He obtains in each of his works a marvelous harmony of color and light. His paintings are in numerous museums in France; in the Petit Palais in Pads, at Langres, Troues Dijon, Saint-Etienne, Tourcoing, Annecy and abroad, in Chicago Museum and at Casablanca.